Fire trucks responded to a home on Buena Vista Boulevard. 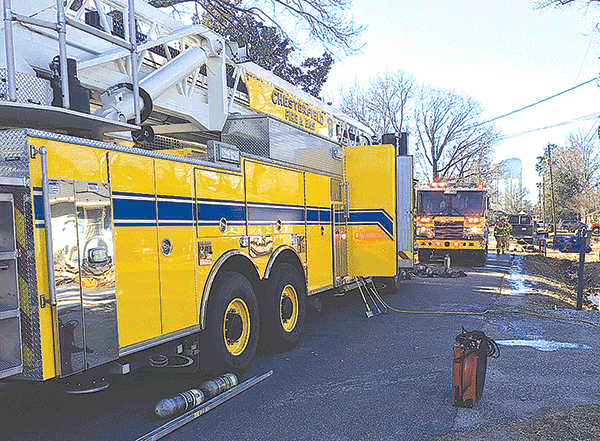 CHESTER – Flames from a Jan. 22 vehicle fire in the 2300 block of Buena Vista Blvd. quickly spread. Officials said that one house sustained exterior damage and the other had fire damage inside. Three adults and four children were displaced, Elmore said. A firefighter was transported to a hospital with a minor injury. Elmore said he was treated and released. 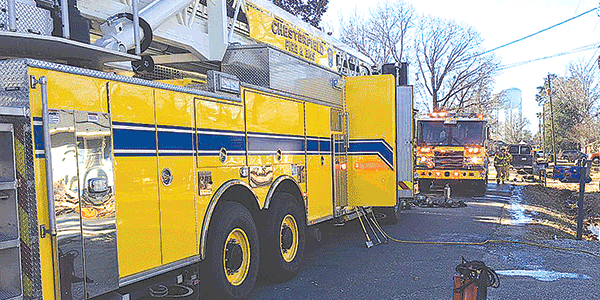 Fire and EMS crews from the Dutch Gap, Centralia and Chester fire stations battled the blaze. A medic unit from Dutch Gap fire station provided EMS care. Two fire department battalion chiefs were also on scene.